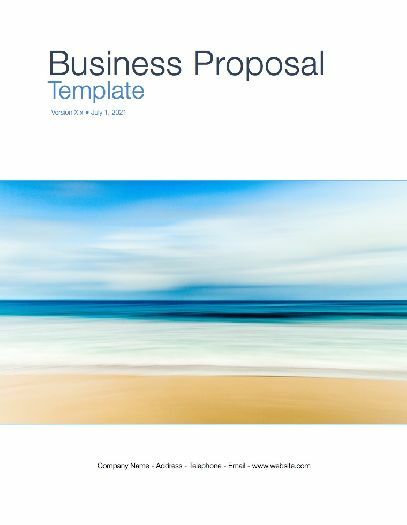 Download these Proposal Templates (10 MS Word designs + 2 Excel files) to create business proposals that will sell your products and services. The purpose of a business proposal template is to help persuade your readers to take action, for example, to persuade a potential customer to choose your goods and/or services, or to persuade a government body to fund a project or implement a program. This proposal template was designed with these requirements in mind. It contains the basic components of a business proposal: start (the Executive Summary), middle (the Body of material to be presented) and an end (the Conclusion). When you download the file, it contains 1o different MS Word templates. You can modify these to suit your requirements and adjust them for different projects. This template of an undersea diver suggests innovation, creativity, social awareness. It can also work for leadership proposals or where you wish to demonstrate that you stand out from the crowd. We have also included several attractively formatted tables, for example, daily rates and costs may be presented in a matrix so the reader can see where the final figures come from. Likewise, we have included Excel spreadsheets, pre-populated with sample material to get you up and running. These include a Project Costs spreadsheet and a detailed Work Breakdown Structure (again with sample data) which you can use as a framework for your proposals. This template helps you articulate your key strengths, your understanding of their requirements, your proposed solution, and what&#8217;s most important, how they will benefit by doing business with you. The package also includes two additional Microsoft Word templates, which have the same material but different cover sheets in case you have a preference. All of the templates can be modified very easily and contain no macros, embedded files or other type of plug-ins. The Klariti branding and logos can be removed by simply deleting the images from the cover sheets. These templates are in Microsoft Word and Excel format and can be downloaded immediately online.